This Rafflesia species is named for the orange color of its flower. Barcelona, J. F., L. L. Co, D. S. Balete, and N. A. Bartolome. 2009. 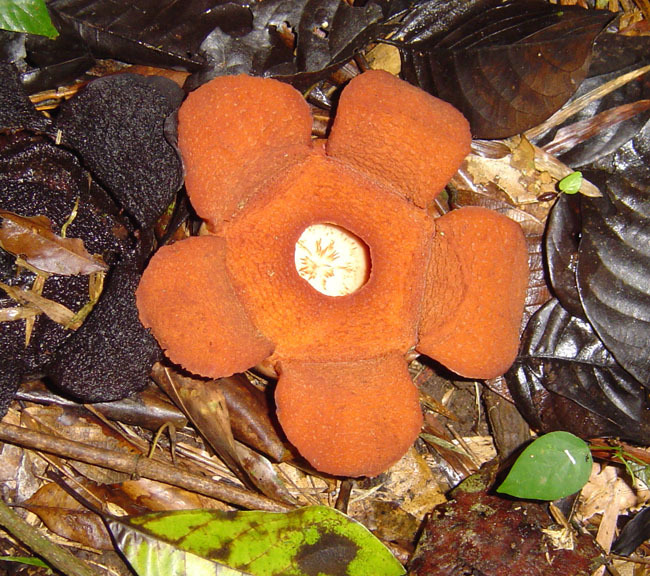 Rafflesia aurantia (Rafflesiaceae): a new species from northern Luzon, Philippines. Gardens' Bulletin Singapore 61 (1): 17-27. This species is the ninth species of Rafflesia named from the Philippines, seven of which having been named after 2002! This species most resembled R. tengku-adlinii of Borneo in that both have orange flowers with relatively indistinct markings. It differs from this species, however, in features of the ramenta, disk processes, and anther number. 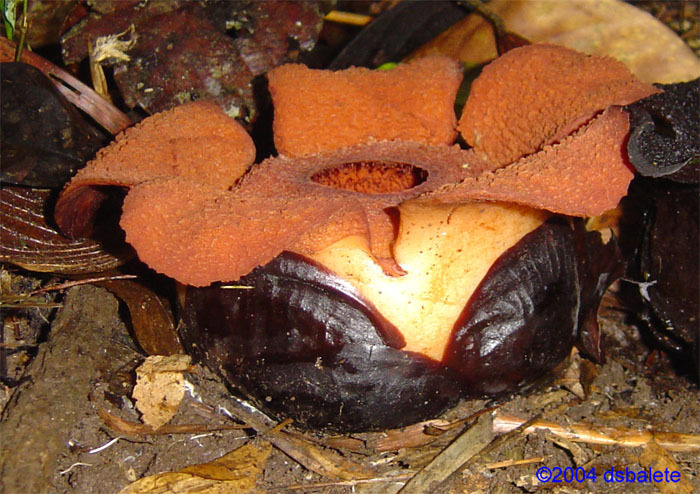 There are currently no species of Rafflesia that occur on both Borneo and the Philippine islands. This suggests that the species have limited dispersal ability and that disjunctions are unlikely. Rafflesia aurantia is only known from its type locality in the Quirino Protected Landscape (QPL), Quirino Province on Luzon Island, Philippines. This population occurs in a disturbed lowland dipterocarp forest on the slopes of the Mungiao Mountains near the headwaters of the Cagayan River. Although the QPL has over 200,000 ha under protection, over 30,000 ha were recently excised, thus, the QPL is now fragmented into three parcels. 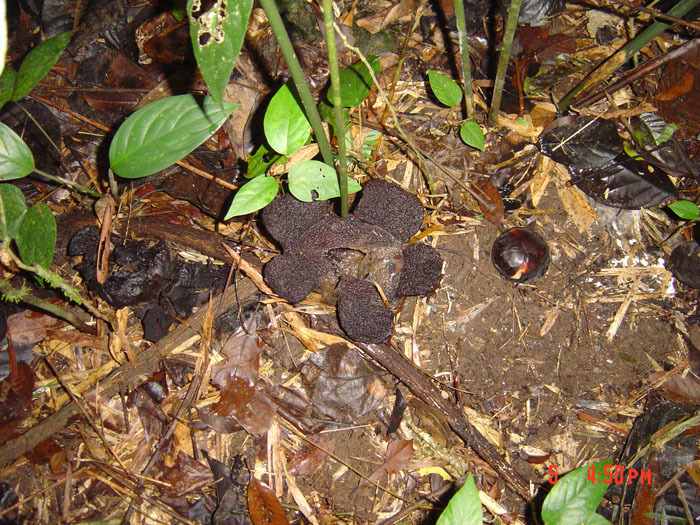 The discovery of Rafflesia aurantia in the Sierra Madre Mountains of Luzon highlights the high biodiversity present in this region. It also represents another example of the need to conserve the rare and threatened species of this region that also includes animals such as the Philippine Eagle (Pithecophaga jefferyi). 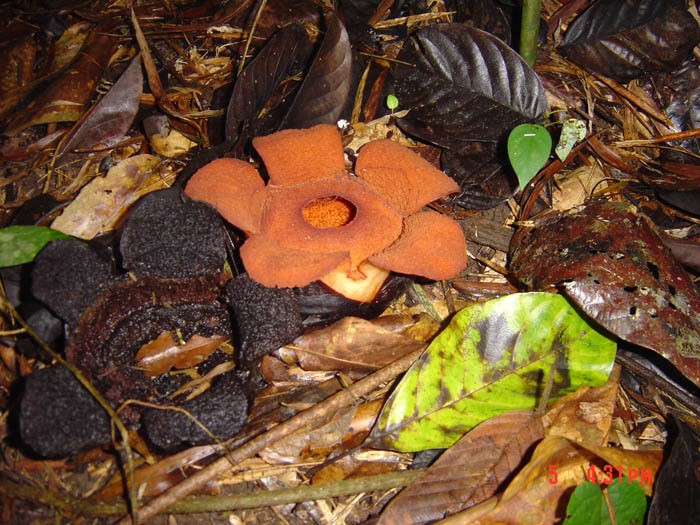 A fully expanded flower of Rafflesia aurantia with a senescent flower (left). Photo by Danny Balete. A flower in face view showing disk processes through diaphragm. Photo by Danny Balete. A flower in side view showing its urn-shape. Photo by Danny Balete. Senescent flowers and a bud. Photo by Danny Balete.